Driver Identifier for Windows 10 - A compact utility for finding and updating device drivers. The application can scan computer components, read information about the manufacturer, model and software version. The utility interacts with a remote database of supported devices, allows you to find the necessary driver, download and install it into the operating system, supports the ability to update versions in the background. The program has an intuitive user interface, uses a step-by-step wizard, and is able to automatically download selected software. 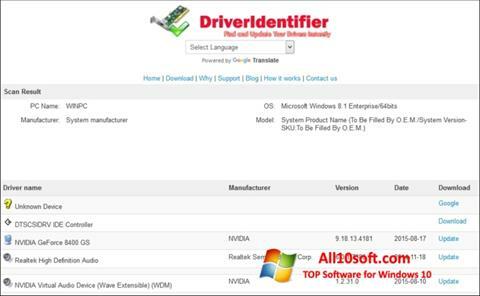 You can free download Driver Identifier official latest version for Windows 10 in English.